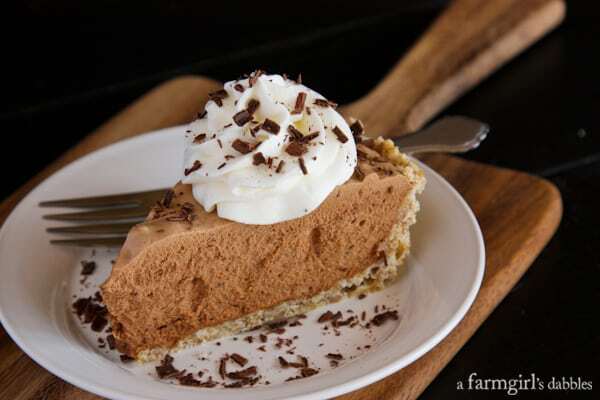 Have you ever made French silk pie from scratch? Well I hadn’t until Hatti requested it for her birthday treat this year. It’s one of those recipes that’s been on my long list for years, but I just never seemed to get to it. Sometimes all it takes is a child’s nudge for a person to try something new, and I’m sure that this Chocolate French Silk Pie with Salted Pecan Crust is not the last time our daughter will challenge me. Because, truly, this pie is unlike any that I’ve made before. Not that it was difficult. The method was just different. And fun. And I’ve already been dreaming about making it again, it’s so good! I shared this photo last week, titled “birthday buddies”. 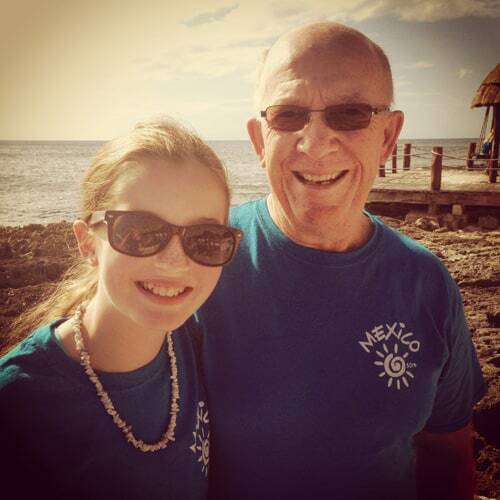 It’s of our daughter Hatti and my dad when we were in Mexico last fall. They are happy to share the same birthday and to document it with photos. I couldn’t help but share it again today, on their actual birthday. This picture full of warm sunshine and even warmer memories simply makes me smile. 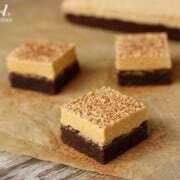 After reading through a few recipes for French silk pie, I realized that I obviously didn’t know the first thing about what it took to create one. There is alot of egg whipping going on! It’s times like these, recipes like this, where a KitchenAid stand mixer is essential. What would I do without mine?! Another chocolate pie to try: Impossible Chocolate Pie from Today’s Creative Life. I think it’s fair to say that my only experiences with eating French silk pie prior to this homemade one has been after sliding into a booth at Perkins or Baker’s Square or beloved little Minnesota gems Betty’s Pies or Joseph’s. Joseph’s is my dad’s favorite place to eat when he comes to visit us because they have awesome broasted chicken and a big menu of fresh homemade pies, made in-house daily. And French silk pie has always been Hatti’s favorite slice there. I love it, too. If you’ve never made a French silk pie, then you’re in for a treat. It’s great fun to see the pie filling gain volume as each egg is added and whipped for a full five minutes each. And if you’re pie crust challenged, like I am, then you’ll be thrilled with this wonderful pressed-in crust. I first tried it out in a super delicious Turtle Pecan Cluster Cheesecake to celebrate my in-laws’ 60th wedding anniversary, and was instantly smitten. The buttery nutty texture contrasts beautifully with the incredible silkiness of the pie. PLUS it’s super duper easy to make!! And the flavor? It’s some kind of fabulous. The filling is perfectly chocolately, with a little boost from espresso powder. I substituted powdered sugar for the regularly called for granular, to get rid of any chance of ending up with a grainy filling. Because I really don’t like that. 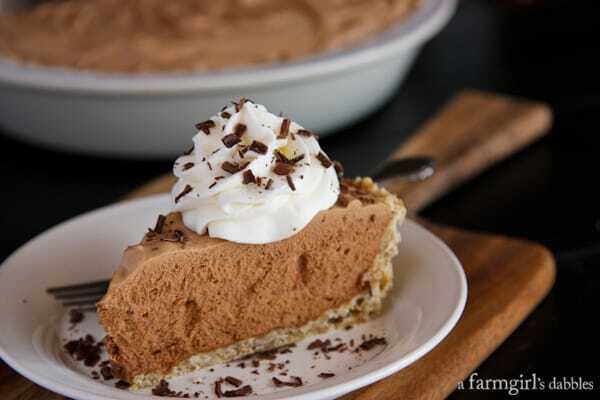 When I’m hungry for French silk pie, I want it super silky! In a small bowl, combine flour, brown sugar, salt, and pecans. Cut in butter with a rigid pastry cutter or a fork until crumbly. Press evenly onto the bottom and sides of a 9″ pie pan. Bake for about 15 minutes, or until set and slightly browned. Remove to wire rack to cool completely. 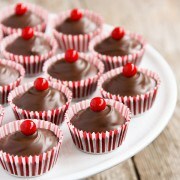 In a small microwave-safe bowl, gently melt chocolates, taking care to not scorch. Set aside and let cool until chocolate mixture is at room temperature. In the bowl of an electric stand mixture, using the paddle attachment, cream together butter and sugar on medium-high speed until fluffy, about 1 to 2 minutes. Drizzle chocolate over butter/sugar mixture and beat on medium-low speed until thoroughly combined. Add vanilla, espresso powder, and salt, and beat until combined. Switch to the whisk attachment. Then add one egg and beat for 5 minutes on medium speed. Repeat with remaining three eggs, beating the mixture for an additional 5 minutes with each egg addition, for a total of 20 minutes of beating. Pour chocolate filling into cooled pie crust, spreading evenly with a spatula. Refrigerate for at least 2 hours or until thoroughly chilled before serving. 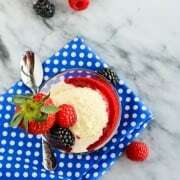 To serve, top with freshly whipped sweetened cream. Garnish with chocolate shavings. From a farmgirl’s dabbles. Chocolate filling adapted from The Pioneer Woman. OMG. This looks amazing. I live in Italy where they have no concept of pie – i’m making this first chance i get! Found you via mom-lovin’ hop! Following you on bloglovin’. Please don’t tempt me to much by these delicious desserts! Nice to meet you, Madaline! This pie sounds fantastic. I love the sweet and salty combination! Yum! Love the pecans in the crust! I bet that pecan crust makes the pie over the top amazing! I like your daughter’s taste in food! Salted Pecan Crust seriously must make this! 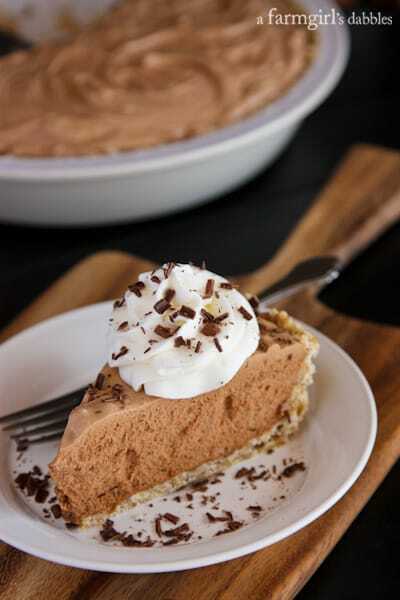 LOVE chocolate silk pie! Your crunchy salty crust with the sweet silkiness of the chocolate sounds just perfect!! I want to make this for my friends when we go up north this week. Can I make it ahead or is it better the day you make it? Can’t wait!! You could definitely make this a day prior to eating it. Enjoy! My sister in law makes this pie for her husband on their anniversary. I was lucky enough to get a slice and it is so good. I am going to get in the kitchen and make one this weekend! My husband surprised me a couple of weeks ago with a new Kitchenaide mixer and I have been pulling it out almost daily. How did I get this far in life without one? 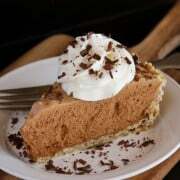 I also have never had French Silk Pie and the addition of a salted pecan crust-Yummy! That Hatti is a keeper!! What a husband!!! ;) Have so much fun with your mixer! MY WORD. You had me at the first picture. Buying ingredients to make this over the weekend! I love that you did it with a nut crust, what a great twist. I’ve never made french silk pie but I’ve eaten it and it’s divine. But the salted pecan crust? That puts it over the top. Pinning. Only in the past few years have I realized my deep, deep love for French silk pie. It’s one of my favorites — and probably THE favorite when this salted pecan crust is involved. Holy yum buckets. So very good. It’s going to be my go-to pie recipe, I just know it! Thanks, Stephanie! This looks incredible! The filling is perfectly light and fluffy! Beautiful pie, happy birthday to Hattie! Wow, this is perfection! I’ve never made this and had no idea what was involved, but it looks completely worth it. Pinned! SO worth it! It’s one of those recipes that stays in your mind, begging to be made again. Thanks, Anna! Looks yummy! Someday when I have a mixer I’ll give it a whirl!! Thank you – I hope you try this some day! I’ve always wanted to make my own chocolate pie! This recipe looks great! The crust alone sounds incredible! This pie is just gorgeous and I can’t wait to give it a try. I think I would do a lot less baking if I didn’t have a kitchenaid standmixer at my disposal. Thank you! And so true. I wouldn’t bake much, either, without it. It’s such a workhorse and time saver. Nice to hear from you, Amanda! Love this Brenda. And a sweet happy birthday! My WORD, Brenda. This pie is glorious looking! I want it for second breakfast! Hmm…I don’t have a kitchen aid, but my friend does, maybe we’ll need to make this for a girls day! What a great excuse to get together with some girlfriends! Happy Birthday to Hatti!! This pie sounds and looks perfect! I love the caramel pecan crust! Seriously that sounds heavenly! Great choice Hatti. I do want to make this myself. Looks so smooth and chocolatey!